This Burma Bridge play feature allows children to develop their balancing skills by negotiating crossing from one side to the other by balancing on a single rope. 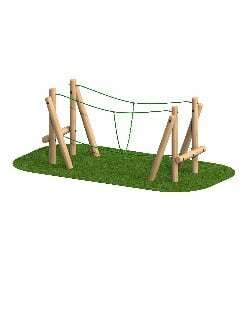 This popular, complete trim trail provides children with a multi-faceted range of physically demanding challenges. The trail includes a Tightrope Crossing, Wobble Bridge, 200mm Stepping Logs, Log Roll with Drop Ropes, Rope Bridge and Sloping Balance Weave. 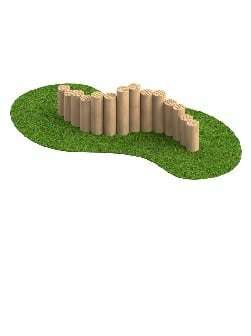 Children can practice balancing and negotiate taking variable height steps on this curved multi-height log snake. This bridge play feature allows children to develop their balancing skills by negotiating crossing from one side to the other. This up and over bridge with tunnel feature challenges children to develop their confidence in climbing and negotiating changes in height. The play feature includes an integrated tunnel for crawling and hiding.